Women of God, if you’ve been looking for an opportunity to get away for extended time with Our Lord yet weren’t sure where to go, we have an incredible retreat opportunity for you this Fall with dynamic author and speaker Sr. Miriam James Heidland, SOLT. 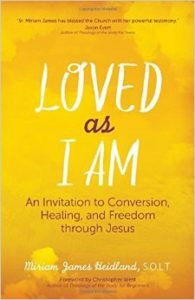 Sr. Miriam is the author of the incredible book Loved As I Am, and has countless speaking gigs under her belt, including Steubenville conferences, Called to Love, and keynotes at Catholic Women Rejoice in 2012 and 2013. She’s also super active on Twitter as @onegroovynun, which is fun for me and all her 17.7k followers on that social media platform. Friday, October 14 (evening) through Sunday, October 16 (afternoon). Opportunity for group prayer, individual prayer, Confession, Mass, Adoration, socialization, walks around the peaceful OLP campus, and, of course, several conference sessions with Sr. Miriam. This is NOT a silent retreat. There is limited space to stay at the retreat house the whole weekend, but we will allow for some retreatants to use the “commuter” option, which means they enjoy everything but the overnight stays. Commuters are responsible to find their own lodging off-site if they do not live locally. Transportation to and from the retreat venue is the responsibility of the retreatant. Folks flying in will want to select PDX (Portland International Airport) as their destination airport. Due to logistical considerations, childcare is not available during the weekend; however, Moms with lap babies are welcome to bring them along! TBD. Full retreat includes lodging for Friday and Saturday nights as well as all meals and materials, while the commuter rate includes all meals and materials but lodging is the responsibility of the retreatant. Space is limited and will sell out, so if you’d like to be included on the registration list, please email: CatholicWomenRejoice@gmail.com or contact us via this form. Meanwhile, if you haven’t yet read Sr. Miriam’s book (and I highly recommend you do), you may learn more about her transformational story here and here.